Spiral Gallery M83. 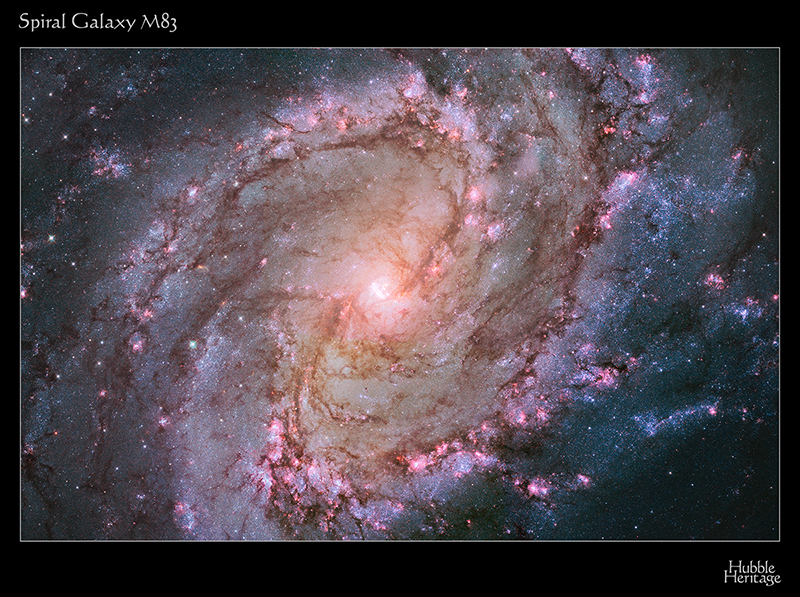 Image from the Hubble Heritage Project. The story of how science advanced seems to have been obscured in the record of history. I can’t tell you how many times I debate atheists who are uninformed about how the growth of science came about. They seem to think the Scientific Revolution was an outgrowth of the Enlightenment period, but the truth is that the Enlightenment period was an outgrowth of the Scientific Revolution–and the Scientific Revolution was a direct result of the growth of Christianity. John Calvin, in particular, had a great impact on the scientific imagination. He brought attention to one scripture which impacted Newton and others who were interested in astronomy. This one verse piqued the curiosity of many men. HOW did the heavens declare God’s glory? HOW did the sky proclaim his handiwork? Are there ways to measure the heavens or recreate the blueprints God used to design the universe? The most important aspect of Calvin’s theology was that it moved western civilization away from the monastic/mystical views that were prevalent in Catholicism. The monastic view insisted on isolation and separation from an evil world of temptations. The mystical view was that God could be found in ecstatic attempts to accomplish divine union through contemplative activity. But Calvin insisted that Christian living should occur in the real, material world. This emphasis alone contributed to the phenomenal growth of science. The Catholic Church had also insisted on blending the scriptures in with the Greco-Roman view of the universe, but the explosion of scriptural knowledge brought about by the Reformation allowed Christians to explore the world without the fetters of classical thought holding them down. They no longer had to fit in with the Catholic Aristotelian world view. They could move beyond the bounds of Catholic dogma without being called before the Inquisitors. This new found respect for the material world, coupled with the thought that God had revealed himself through his creation, opened up a whole universe filled with excitement and new revelations as men now attempted to find God in the world around them. Johannes Kepler, who was a Lutheran, was excommunicated by the Catholic church in 1612. He discovered the laws of planetary motion because he wanted to understand the mind of God, and he was thrilled to find out that God was a designer! Attempts to associate the origins of the Scientific Revolution with the Renaissance or Enlightenment periods are inaccurate. The Renaissance was a rebirth of the Aristotelian worldview, which had been recovered as a result of contact with the Muslim scholar, Averroes, but science didn’t advance as a result of this knowledge. In fact, it was stunted as the medieval Church attempted to blend this knowledge in with the scriptures (just as they had also blended Greek philosophy in with the scriptures and formed medieval scholasticism). Instead, it was the direct attempt to overthrow classical thought by the men of the Reformation that led to the explosive growth in science, The Enlightenment was merely a consequence of the Scientific Revolution, particularly as found in the work of Isaac Newton. The list of scientists who would declare that it was their faith in God that led them to their scientific knowledge could read like a virtual “Who’s Who” of Scientific Advancement and Discovery. Collins’ faith didn’t hinder his scientific work. It motivated him and filled him with awe. This was a common experience of believing scientists. Isaac Newton said that his work was like child’s play. To these great scientists, unlocking the secrets of the universe was like an adventure. It inspired wonder and respect for the sheer genius and elegance of the Creator. Is there not magnificent order in the universe? And is it not governed by powerful and dependable laws such as the point at which water freezes or the gravitational pull necessary to keep things in place? The Scientific Revolution was an attempt to discover evidence for God in the material realm and their discoveries have blessed humanity. Christianity isn’t the enemy of science. It has been the foundation for some of the greatest scientific achievements ever produced. *This list is based on one found in the book by Henry Morris called Men of Science, Men of God. San Diego, CA: Creation Life, 1982, p. 121-123. Previous What Does it Mean to Not Blend the Woolen and the Linen? Next Why Virginia Heffernan is Right to Side with the Scriptures Over Science.